In secured environment (i.e. Databases implemented with Microsoft Access Security) several options are available to protect data from unauthorized changes by Users. With User-level security settings we can define clearly who can make changes to the data, view data or which group of Users are not allowed to open a Form and so on. 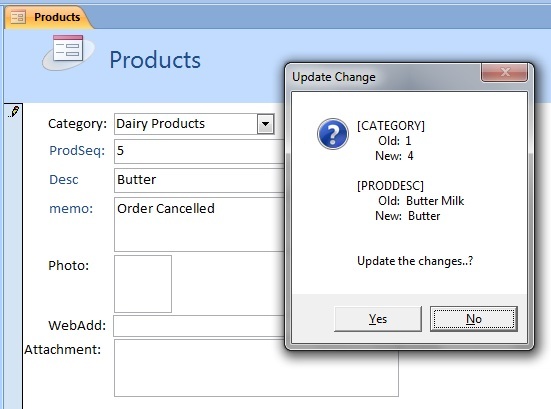 But, these features are not available from Microsoft Access 2007 and latter versions. I wonder why Microsoft discarded this powerful feature now. Whether the database is secured or not data integrity is an important factor; no matter what method we adopt to protect it. We are going to highlight a small issue that can happen during data editing/viewing. Assume that the User has to search and find certain records on the Form and modify certain field values. For example, Customer Telephone Number or Fax Number or some other information have been changed of customers and needs to update those records on the file. When the User moves out from one record to the other, if the User has made any changes to the record then MS-Access should ask for reconfirmation from the User before updating the record. 1. The first method is very simple; do an over all check for changes in current record, irrespective of which field the user has changed. This can be done by simply checking the Dirty Status of the Form. But, this method cannot detect which field the user has changed and which one is not. We can only give a warning to the User that he has made some changes on the record. If the user agrees to update the changes then proceed otherwise cancel. 2. The second method is very effective and tracks each field change the User makes on the record. Before updating the record show the changes to the User for review and if the response is positive from the user then update them otherwise cancel. Let us try the first method on a form. 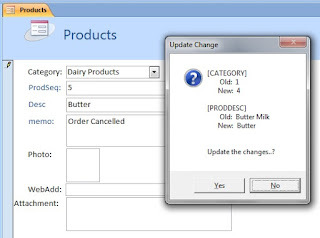 Open one of your databases with a Data Editing Form. Open an existing Form in Design View. Display the VBA Module of the Form. msg = "Update the changes on Record." & vbCr & vbCr & "Proceed...?" MsgBox Err & " : " & Err.Description, , "Form_BeforeUpdate()"
Make some changes on one or two fields on the current record. Press Ctrl+S to update the changes. If the User selects Yes the changes will be updated on the record otherwise old values will be restored. In this method the User must be vigilant about the changes that he/she is making on the record. MS-Access will not give any clue as what changes made and in which field those changes took place. On the Form_Load() Event Procedure the structure of the recordset attached to the Form is scanned for Field Names and Data Types. Field Names and Data Types are loaded into two similar Variant Arrays (Rec() and Rec2(), both are two-dimensional arrays), leaving one element of the Array for loading Field Values later. Memo, OLE Object, Hyperlinks and Attachment fields are exempted from validation checks. On the Form_Current() Event Procedure the current record field values (except Memo, OLE Object, Hyperlinks and Attachment fields) are loaded into Rec() Array. If the User creates a new record then the values are not loaded or checked. After this action the User may make changes to the record. 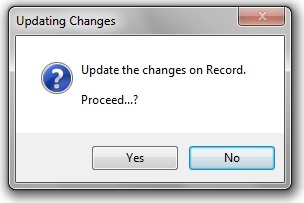 Here, the User can check his changes and reconfirm before updating the record by selecting Yes from the Message Box or No to cancel the changes and restore old values. 'If not approved by User reverse the change. msg = msg & vbCr & "Update the changes..?" MsgBox Err & " : " & Err.Description, , "Form_Current()"
MsgBox Err & " : " & Err.Description, , "Form_Load()"
The Code is not extensively tested for logical errors. Use it at your own risk. Excellent article. I added few more lines to your code to insert into a Auditlog table so I can keep track of all changes. Thanks for sharing your knowledge. Helps a lot.